Perfect for bulbs, bedding, shrubs, houseplants and more. Metallic bronze finished, antique effect planter with a large 38cm diameter. Ideal for large items like standard trees and shrubs and is especially great for instant impact items like bay trees, olives, cordyline or phoenix palms. Made from heavy-duty injection moulded polypropylene. 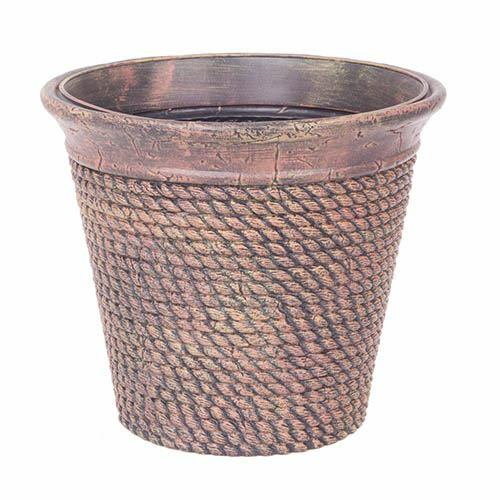 Perfect for bulbs, bedding, shrubs, houseplants and more, this metallic bronze finished planter with a large 38cm (15in) diameter will add an rustic, decorative look to your home or garden, without the cost of real metal pots or expensive pottery or terracotta. Large in size, the Rope Pattern Planter can used for large items like standard trees and shrubs and is especially great for instant impact items like bay trees, olives, cordyline or phoenix palms. Made from heavy-duty injection moulded polypropylene, it’s tough & durable and also frost & UV resistant, so will withstand the worst of our British weather, perfect for using year after year. Supplied as a single planter, 18.5 litres volume, 33cm (13in) height. Made from heavy duty polypropylene, UV stable and weather resistant. 38cm (15in) diameter, 18.5L volume, 33cm (13in) height.